Q-absorb™ is a completely natural proliposome lipid soluble delivery system clinically shown in humans to increase Co-Q10 levels up to 400% (3.2x) over baseline and 3-4 times better absorbed than chewable CoQ10 tablets. Co-Q10 supports heart function as a component of the electron transport system, and as an antioxidant protects mitochondrial membranes and cholesterol from oxidation. 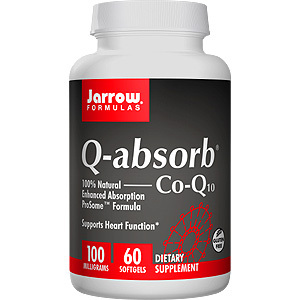 Jarrow Formulas Q-absorb™ restores Co-Q10 levels reduced or depleted by use of statins. Take 1 to 3 softgels per day with food, or as directed by your qualified health consultant. Other Ingredients: Lecithin and medium chain glycerides (MCGs). Softgel consists of gelatin, glycerin and water. Carob extract added as a light barrier. Particle formation inside softgel is normal and dissolves after ingestion. Contains: Soy. What country do you get your CoQ10 from? Our CoQ10 is manufactured by Kaneka Corporation in Osaka, Japan. Is your CoQ10 ?natural? or ?synthetic? ; is it the ?trans? form or the ?cis? from? Our CoQ10 is 100% natural, trans CoQ10, which is the biologically active form. Q-absorb Co-Q10 - is shipped in a discrete, unmarked package. Orders are processed immediately and usually take about 3 to 5 working days to be received. We do ask that you try it for 2 to 3 weeks to feel the full effects. Any information received is used only for order processing and shipping purposes. Your information, such as e-mail address, will never be disclosed to a third party.